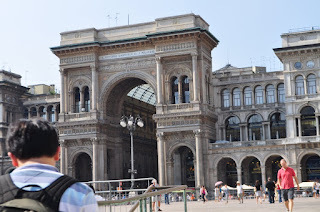 This is the Vittorio Emanuele Gallery II, a glass domed cruciform that is now a vast Belle Epoque shopping arcade. It links the Piazza del Duomo to the Piazza della Scala and soon became Milan's conservatory. 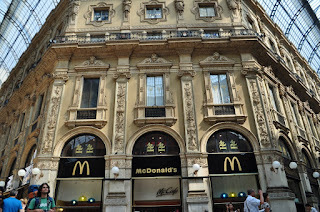 It's main facade is adjacent to the Duomo, Milan's landmark. All season, from winter, spring, summer and fall, Milanese can be seen here, escaping the heat and the rain, browsing through the exclusive shops and sipping Campari (an Italian drink famous for its red color and made by steeping a secret mix of herbs in alcohol) and soda in the bars. There goes my two loves... off to the Savini Restaurant to buy some gelato. The LV shop here is never empty. I just got the chance to photograph the eye-catching window decor for a brief moment when everyone else was busy watching the live football game of Germany against Australia. Anywhere in the world, there will always be a McDonald's. At a prime location at that! Feeling locals... We were trying to blend in with the crowd and found ourselves sitting on the mosaic-patterned floor of the arcade. Can't think anymore of a subject to photograph so there goes my happy wanderlust feet! Very nice view. Ang ganda ng place. Dream place talaga yan sis.